Given the long history of fermented foods, Hutkins says researchers like himself—his lab studies bacteria important in fermented foods and human health—are a bit surprised that fermented foods suddenly have become trendy. "Consumers are now more interested than ever in fermented foods, from ale to yogurt, and all the kimchi and miso in between," he says. "This interest is presumably driven by all the small/local/craft/artisan manufacturing of fermented foods and beverages, but the health properties these foods are thought to deliver are also a major driving force." California-based dietitian and cookbook author Jill Nussinow, MS, RDN, aka The Veggie Queen, an adjunct chef instructor at Santa Rosa Junior College, frequently gives talks to consumers about fermented foods. "They often think that foods that might be fermented such as pickles and sauerkraut but are canned, processed, or pasteurized still have beneficial probiotic effects. They also do not understand that food such as yogurt doesn't always have active cultures." Mary Ellen Sanders, PhD, executive science officer for the International Scientific Association for Probiotics and Prebiotics (ISAPP), says the research on functional health benefits of fermented foods is evolving. "We need more randomized, controlled trials on defined fermented foods so we can better understand the health benefits associated with their consumption," she says. "Mechanistic studies are needed to better understand what aspects of a fermented food—the live microbe, a fermentation-derived metabolite, or nutrition—contribute to conferring the benefit." Sanders says there's evidence that some fermented foods are associated with healthier blood lipid profiles, improved glucose tolerance, improved digestive function and, in the case of yogurt, improved tolerance to lactose. However, their renewed popularity can oversimplify a complex area of science. "There's little downside to consuming fermented foods as part of a healthful diet, and, in fact, there may be benefits. But it's important not to let the hype get ahead of the science," Sanders says. Fermented foods with live cultures may contribute to the health of the gut microbiota, in turn reducing the risk of some acute and chronic diseases.5 But, as mentioned, some fermented foods don't retain live cultures. Those that do don't necessarily have probiotic functions. One common myth about fermented foods is that they're the same thing as probiotics. The World Health Organization defines probiotics as live microorganisms, which, when administered in adequate amounts, confer a health benefit on the host.7 "To be a probiotic food, a fermented food must retain an adequate level of live microbes that have been shown to have a health benefit. Not all fermented foods reach that bar," Sanders says. "Demonstrating that a microorganism actually confers a health benefit is a key point and requires substantial clinical evidence, including randomized clinical trials," Hutkins says. "Importantly, such studies also require that specific and well-defined microbial strains are used." For example, Lactobacillus rhamnosus GG is a known probiotic, and referred to by genus, species, and strain. Hutkins says live microorganisms in fermented foods rarely are characterized or defined, let alone tested to determine whether they confer probiotic health benefits. One reason may be logistical; the specific organisms in foods such as kimchi, sauerkraut, and miso vary by batch, manufacturer, and location. The one exception is yogurt. "European health authorities have determined that even the generic yogurt bacteria can help improve digestion of lactose among individuals with lactose maldigestion," Hutkins says. Science and industry are moving far beyond "artisan," aiming to provide specific health benefits by optimizing starter cultures and producing fermented functional foods.3,8 Hutkins gives the example of probiotic bacteria added to fermented foods such as yogurt, kefir, or kombucha. "These foods are essentially serving as the delivery vehicle for the probiotic," he says. "In this case, adding the probiotic to fermented foods makes sense, since they will be kept cold, and any acid or sourness they might produce would hardly be noticed. Some foods (especially dairy) also may protect the organisms during digestion." Sanders points to examples of several foods that contain true probiotics: Yakult (L casei Shirota), Activia (Bifidobacterium animalis DN-173 010/CNCM I-2494), Nancy's yogurt (B lactis BB-12), Dahlicious Lassi (B lactis BB-12 and L acidophilus LA-5), Good Belly (L plantarum 299v), Gerber Good Start Infant Formula (B lactis BB-12), and Tropicana Probiotic juice (B lactis HN019). Many fermented foods contain 1 million to 1 billion viable microbes per gram or milliliter, and a large portion of those survive passage through the digestive tract, so eating fermented foods could increase the number of microbes in the diet by up to 10,000-fold. While these microbes may play only a transient role in an individual's native microbiota, they still have demonstrated benefits, including benefits for brain and immune function.4 But is this because they're probiotic? This is where Hutkins says it gets interesting. "Organisms in sauerkraut, kimchi, and other fermented foods are often closely related, even to the species level, to organisms that have been reported to have probiotic functions," Hutkins says. "For example, one of the most abundant organisms in sauerkraut and kimchi is Lactobacillus plantarum. One particular strain called L plantarum 299v, is a very well-studied probiotic that is added to a range of commercial foods and supplements. So do the wild strains of L plantarum share the same traits that make 299v a probiotic?" This question was addressed at a recent ISAPP meeting. "The researchers suggested that there were health benefits that were indeed strain-specific, whereas others were more general and likely shared by most members of the same species or even genus," Hutkins says. On one hand, many species of Lactobacillus and Bifidobacterium help crowd out pathogens, maintain gut barrier function, and produce organic acids that nourish colonic cells and enhance gut health. Some immune effects also may be shared broadly among similar species. On the other hand, certain clinical benefits—such as production of a particular vitamin in the gastrointestinal tract or a particular immune effect—may be limited to a specific strain. Even though live cultures are one important way fermented foods can benefit consumers, Hutkins says it's not the only way. "Wine is free of organisms at the time of consumption, but the yeasts produce ethanol during fermentation and the ethanol enhances extraction of phenolic compounds from the grapes. These phenolics have antioxidant activity known to have many health benefits, ranging from heart health to systemic anti-inflammatory effects. Likewise, the bacteria and yeast used in the manufacture of sourdough bread are inactivated during the baking process, but during fermentation, sourdough bacteria combined with enzymes may degrade part of the gluten—although not quite enough to be gluten-free." This is why many people with nonceliac gluten sensitivities find they can tolerate breads that have long fermentations. Another benefit of fermentation is that it creates desirable tastes and textures. For example, fermentation removes the bitter taste from fresh table olives—making them edible—and turns flour, water, and salt into leavened bread dough.4 "Parmesan, Roquefort, and aged cheddar cheese. A tart cup of yogurt or effervescent kefir. A crusty sourdough rye bread. Miso soup. Kalamata olives. Cabernet sauvignon. They enrich our lives in so many ways," Hutkins says. In fact, the flavor factor may be a good tool for helping patients incorporate more fermented foods in their diets. Nussinow suggests adding pickle or sauerkraut juice to mixed grain bowls for more umami flavor. The juice—along with miso and plain yogurt—are good choices for patients who can't tolerate fermented vegetables. "Fermented foods have the ability to turn a bowl of brown rice into an 'exotic, gourmet' meal. Nothing like a bowl with brown rice and veggies with some kimchi on top and a drizzle of tahini—at least for me." 1. Selhub EM, Logan AC, Bested AC. 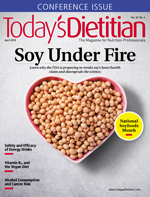 Fermented foods, microbiota, and mental health: ancient practice meets nutritional psychiatry. J Physiol Anthropol. 2014;33:2. 2. Chilton SN, Burton JP, Reid G. Inclusion of fermented foods in food guides around the world. Nutrients. 2015;7(1):390-404. 3. Borresen EC, Henderson AJ, Kumar A, Weir TL, Ryan EP. Fermented foods: patented approaches and formulations for nutritional supplementation and health promotion. Recent Pat Food Nutr Agric. 2012;4(2):134-140. 4. Marco ML, Heeney D, Binda S, et al. Health benefits of fermented foods: microbiota and beyond. Curr Opin Biotechnol. 2017;44:94-102. 5. Hutkins R. Fermented foods. International Scientific Association for Probiotics and Prebiotics website. https://isappscience.org/fermented-foods/. Accessed January 24, 2018. 6. Campbell K. Your guide to the difference between fermented foods and probiotics. Gut Microbiota News Watch website. http://www.gutmicrobiotaforhealth.com/en/guide-difference-fermented-foods-probiotics/. Published July 26, 2017. Accessed January 20, 2018. 7. Morelli L, Capurso L. FAO/WHO guidelines on probiotics: 10 years later. J Clin Gastroenterol. 2012;46 Suppl:S1-S2. 8. Leroy F, De Vuyst L. Fermented food in the context of a healthy diet: how to produce novel functional foods? Curr Opin Clin Nutr Metab Care. 2014;17(6):574-581. 9. Fernández M, Hudson JA, Korpela R, de los Reyes-Gavilán CG. Impact on human health of microorganisms present in fermented dairy products: an overview. Biomed Res Int. 2015;2015:412714. 10. Kim B, Hong VM, Yang J, et al. A review of fermented foods with beneficial effects on brain and cognitive function. Prev Nutr Food Sci. 2016;21(4):297-309. 11. Islami F, Ren JS, Taylor PR, Kamangar F. Pickled vegetables and the risk of oesophageal cancer: a meta-analysis. Br J Cancer. 2009;101(9):1641-1647. 12. Ren JS, Kamangar F, Forman D, Islami F. Pickled food and risk of gastric cancer — a systematic review and meta-analysis of English and Chinese literature. Cancer Epidemiol Biomarkers Prev. 2012;21(6):905-915. 13. Gancz H, Jones KR, Merrell DS. Sodium chloride affects Helicobacter pylori growth and gene expression. J Bacteriol. 2008;190(11):4100-4105.